Donated to Cooper Hewitt, Smithsonian Design Museum by New York-based textile dealer Elinor Merrell, this bedcover offers an opportunity to see how motifs employed in America were influenced by distant cultures. In the hands of a highly skilled needle-worker deft at using stem-stitch, satin-stitch, and button-hole stitch techniques, a rare coverlet was created. This block-style embroidered presentation quilt was completed in 1900 by an unknown maker. “Block-style organization, which made its first appearance in the United States soon after the turn of the nineteenth century, took an entirely different approach (than European examples). It eliminated the central focus of the medallion, instead breaking the quilt top into a grid of equal-size units, each of which was important to the overall design. The blocks could all be made from the same pattern, or each one could be different. In any case, the blocks were made one at a time and sewn together when enough of them had been completed to construct a full-size quilt top.” Cooper Hewitt’s example of a block-style cover was created from diamond shaped blocks with highly stylized floral designs and japonaiserie patterns embroidered in blue and gray threads. 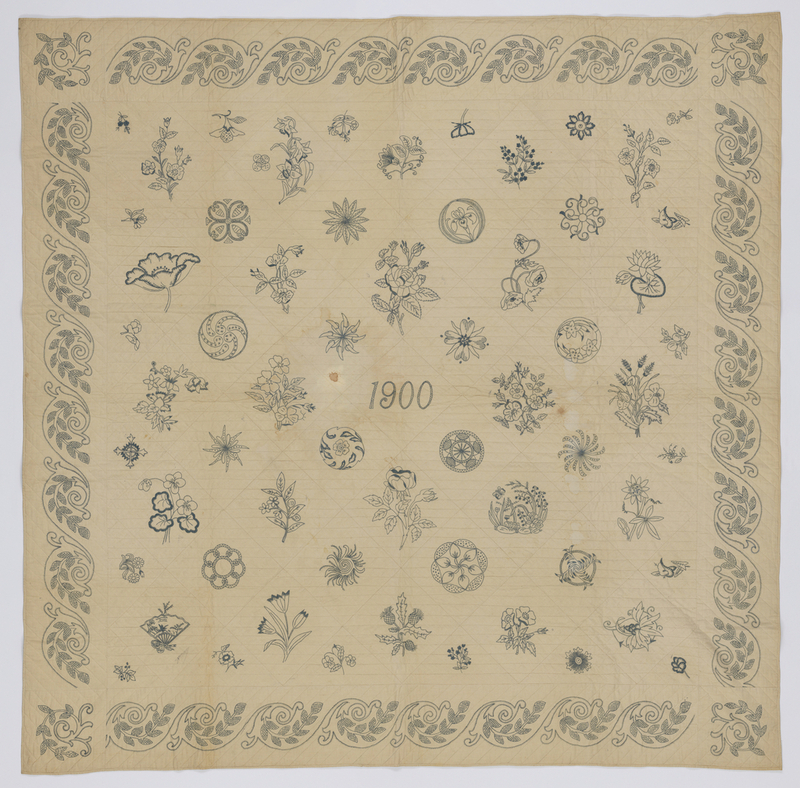 The motifs that the maker expertly executed were first seen in American quilts after the 1876 Centennial Exposition. The use of Japanese-inspired designs “reached a peak after public exposure to the exhibits of Japanese arts and handcrafts at the 1876 Centennial Exposition in Philadelphia. Japan had been open to the West for less than twenty years when the exposition took place, and the mysteries of the country and its arts fascinated Americans.” After the 1893 World’s Columbian Exposition in Chicago, Candace Wheeler, who headed up the “Woman’s Building” at the Exposition, wrote in an essay about what was on view in that pavilion: “Certain processes which belong to the oldest oriental embroidery, such as a combination of appliqué and embroidery, which were ignored by the English school as being irregular, have been adopted by individuals among us, and have produced most wonderfully artistic results.” The fashion for Japanese design motifs reached such a fever pitch in America after the 1876 Centennial Exposition and the introduction of objects by Christopher Dresser during the Aesthetic Movement that ladies’ magazines like Godey’s Lady’s Book advertised embroidery kits for order that featured some of the same motifs as the embroidered patterns in this quilt. “Oriental” fans very similar to one seen in the lower left corner of Elinor Merrell’s quilt were available, as were flowers much like those used by this quilt maker. A quilt of very similar technique in the collection of Colonial Williamsburg is made from embroidery patterns that were ordered from a catalog or magazine and then sewn-up block-style to form a quilt. While there are red-and-white and green-and–white examples, there are no surviving quilts of the same coloration or motifs found in any museum collection, making Elinor Merrell’s donation to Cooper Hewitt seem quite rare. Additionally, embroidery was far more often used as a secondary decorative element in quilts. To have a quilt that is entirely about the embroidered motifs adds to this quilt’s rarity. Considering the importance of Merrell as a dealer and her focus on the rare and important, that is not surprising. Because the quilt is dated so prominently on the center medallion, it was most likely a presentation or gift quilt to someone celebrating a special occasion in 1900 when it was completed. Lucky recipient! Shaw, Robert. American Quilts: The Democratic Art (New York: Sterling Press, 2009), 57.